Conducting effective maintenance on your production facility or equipment, or workstations is essential, whether your company is big or small and regardless the industry you operate in. Knowing which is the right maintenance strategy for you and when you should adopt any of it is a good way to begin. 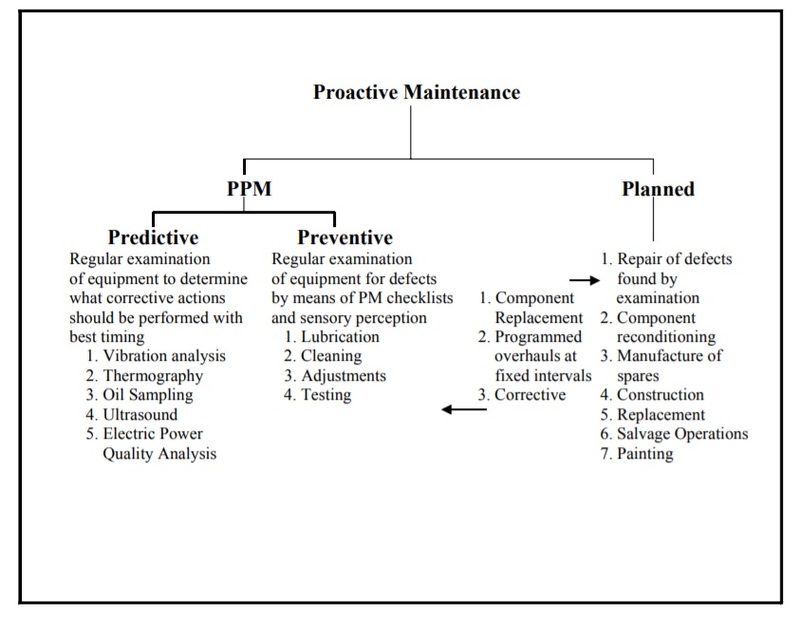 In this article, we outline the importance of predictive maintenance (PdM), the advantages as compared to corrective maintenance and the different technologies applied in predictive maintenance. Failures in plant operations should be minimized to the lowest possible value through the effective execution of predictive maintenance. According to the general rule of thumb (the 80/20 rule), only 20% of time spend on maintenance should be directed towards corrective actions, while the remaining 80% should be spent on predictive/proactive maintenance. Higher long-term costs: Corrective maintenance is applied when it is believed that the stop and repair costs in case of failure will be less than the investment required for planned maintenance. But this doesn’t always happen. When a catastrophic failure occurs, it can be extremely costly, causing negative effects on reputation, client satisfaction, safety and on the ability to run a business efficiently and productively. Predictive maintenance is very suitable for assets which have a critical operational function, with the purpose of avoiding failures and mitigating the consequences of equipment breakdowns. 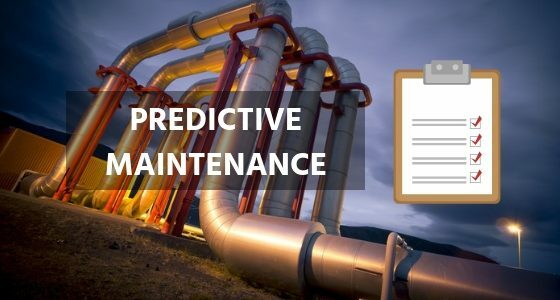 Predictive Maintenance, also known as condition-based maintenance is aimed at predicting when a failure might occur and preventing them. What is the predictive maintenance measuring? Is it directly measuring the form of deterioration that most commonly results in the failure of the device? Or is it measuring some behavior that occurs as a secondary result of the deterioration? Is the response that should be taken as a result of various predictive maintenance measurements clearly defined? Now these numbers may seem high. But even if you take only a fraction of these benefits, the financial impact of an effective PdM program at most plants can easily reach into millions of dollars. And, for the typical manufacturing plant, a 10% reduction in maintenance costs has the same bottom line benefit as a 40% increase in sales. Another advantage of predictive maintenance is this: Studies have shown that with a properly-engineered PdM program, you can replace up to 30% of your Preventive Maintenance tasks (PMs). 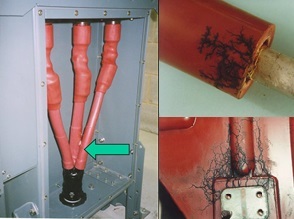 Reactive maintenance is a common practice for some facilities. Being the opposite of preventive and predictive maintenance, reactive maintenance is essentially waiting for an incident to occur. This practice may seem like a cost saving strategy, but when unplanned downtime occurs, you spend more time fixing the issue than if you had done predictive maintenance, to correctly predict and prevent such incidents. This delayed maintenance could result in negative publicity for your facility and, in turn, compromise your customers’ trust. When certain undesirable conditions are detected, then a repair is scheduled before an actual failure happens. This way, it is ensured that the repairs are both necessary and timely, which isn’t always the case with Corrective Maintenance or Preventive Maintenance. 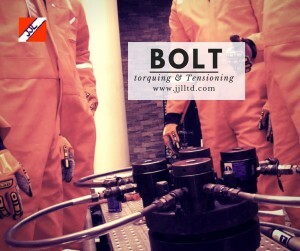 Non Evasive Partial Discharge testing conducted on all switch gear from 3.3kV – 38kV using the UltraTEV test meters. 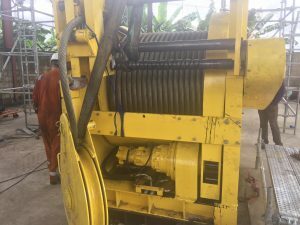 Using vibration analysis on rotating machinery enables the early detection of faults before failure. This analysis will help you conduct a detailed assessment of your rotating plant and form the basis for improvement to deliver effective cost savings. The aim therefore, is to evaluate machine condition for weaknesses, thus enabling the early diagnosis of faults. This in turn allows repairs to be planned and performed economically. Wear detection of rolling element and plain bearings. Diagnosis and correction of imbalance and misalignment. 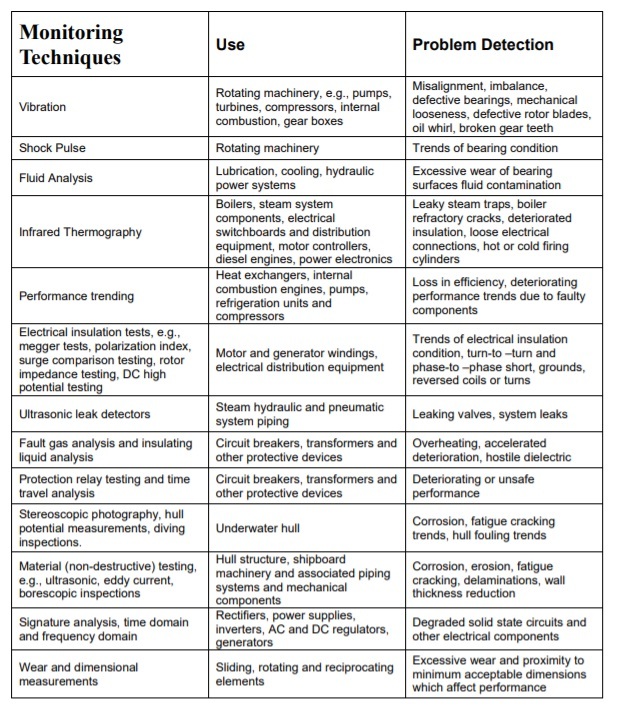 Diagnosis of electric motor rotor defects. Early detection of coupling defects. is the fastest growing area predictive maintenance available today. 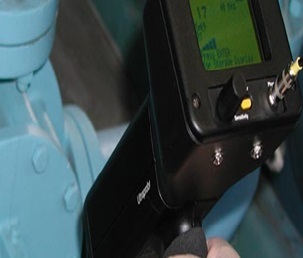 The development of hand held focal plane array based systems enables predictive maintenance engineers to bring the thermographic camera to virtually any equipment site with ease. Advanced image processing and reporting programs facilitate fast and easy analysis and documentation of survey results. Checking the health and cleanliness of lubricants as they arrive. It is a common and dangerous assumption that all new oil is clean and healthy. Utilization of all oil analysis data allows you to run a predictive maintenance program that monitors the condition of the oil and machinery through particle counts and identification. This information allows the engineer to determine the life cycle of the machine and when oil and filters require changing. 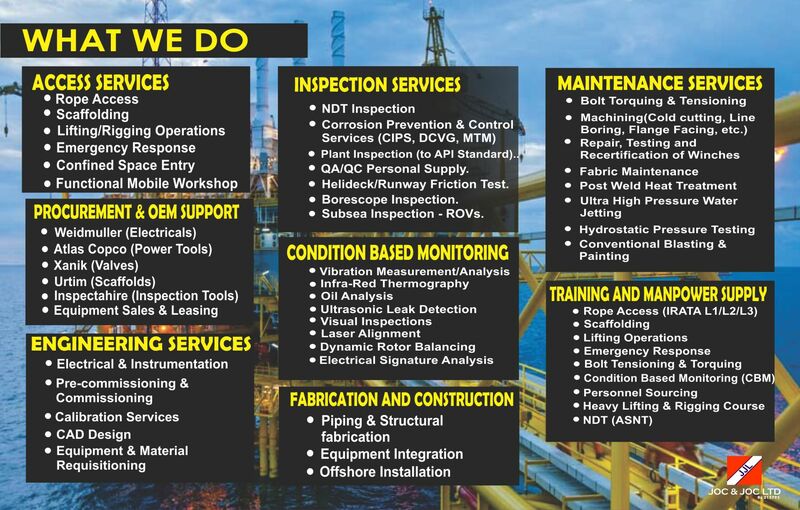 An effective oil analysis program involves all individuals within the companies’ maintenance regime by empowering them with the knowledge and data to act in the best interest of the organization. 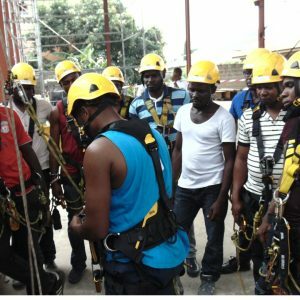 These inspections are still vital to the maintenance operation however in addition to the standard visual inspections operators can be equipped with condition monitoring instrumentation and trained in the collection of data to enable trend analysis of critical assets and early identification of faults. 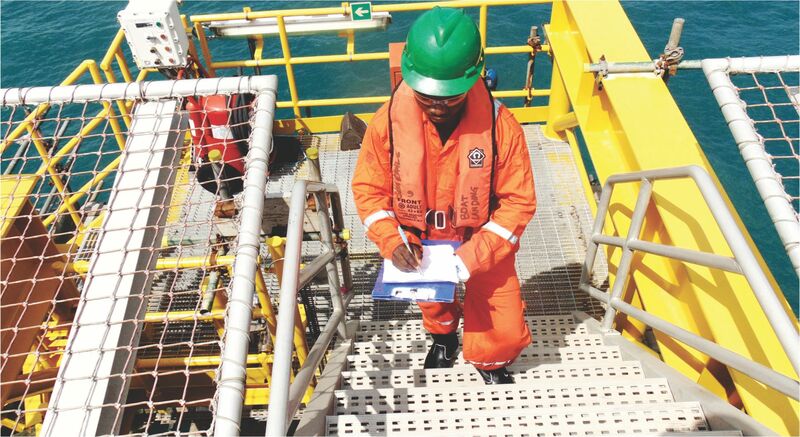 A personnel of JOC & JOC LTD performing visual inspections at BONGA FPSO, Offshore Nigeria. When used by itself or in conjunction with other predictive technologies, ultrasound is a simple technology that offers tremendous value at isolating costly problems that if left undetected could easily shutdown production or an entire plant. Predictive Maintenance is now a significant aspect of management best practice within manufacturing industry. Avoiding losses from unscheduled downtime, reducing direct labour and other maintenance costs and managing Health & Safety risks are all of paramount importance. Additional responsibilities are being placed on directors and senior managers in both the private and public sectors, to comply with energy conservation and other environmental regulations. Identify equipment and training requirement to enable workforce to complete routine monitoring of plant and equipment. Establish any valve leaks that can endanger facility operations.